Rick Glawson Sword Pinstriping Brush series 1645 by Mack Brush was designed by Rick a.k.a. "Daddy Finegold" Glawson. 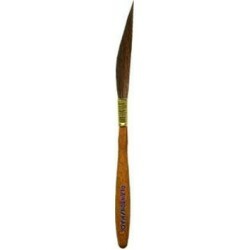 This brush is great for pinstriping, hand painting used by pinstripers and sign painters. Designed for water-based paints that are more dense than lettering enamel, but also good for urethane paint or lettering enamel. Rick Glawson says "They are great for long thin lines!" Rick was known for his work with gold leaf and really designed this for Reverse Glass Gilding when backing up gilded gold leaf on glass. Rick's design on the Rick Glawson Sword Pinstriping Brush series 1645, has a longer belly than most pinstriping brushes, which are designed to really pull a long continuous line. The difference between the 1644 and the 1645 is the mix of hair in this pinstriping brush. The Rick Glawson Sword Pinstriping Brush series 1645 is made of Squirrel and brown Taklon available in size 0 hair length of 2-1/4", overall pinstriping brush measures 5-1/2" long. More information listed below.